In my humble opinion, it is an astute business leader indeed who commissions a company advertisement in the shape of a building. Think about it…clients are given a well-made replica of a landmark and what do they do? They display it proudly on their desks as a reminder to them and to others who visit their office. 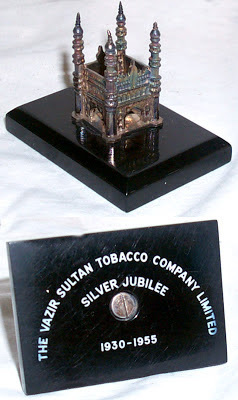 I’ve collected photos and information of some advertisement building replicas with photos and info below. If you know of others, send me some photos and I’ll add it to this grouping. 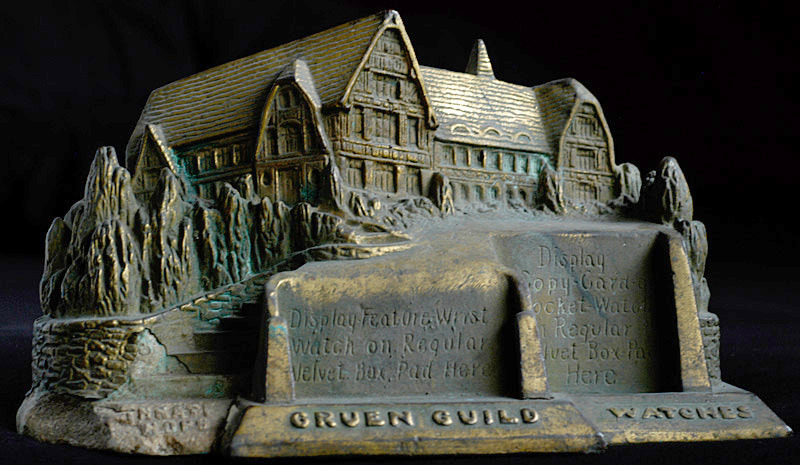 The Grue Guild Watches store display is a building replica made of metal. The engraved text reads, “Display feature wrist watch on regular velvet box pad here” and “display copy-card pocket watch and regular velvet box pad here.” The metal display is a replica of the Gruen office & factory. The Gruen Watch Company was formerly one of the largest watch manufacturers in the United States. It was in business from about 1894 to 1958 and was based in Cincinnati, Ohio. 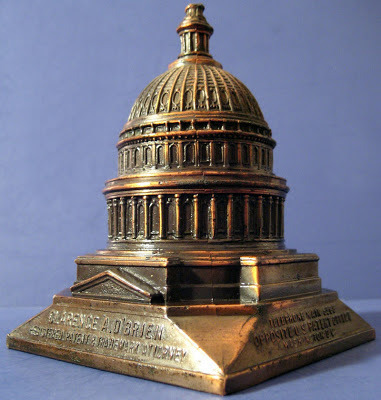 In the 1930’s & 40’s, Patent and Trademark Attorney A. Clarence O'Brien advertised his services via two finely made metal paperweights of the U.S. Capitol dome and the Supreme Court building. 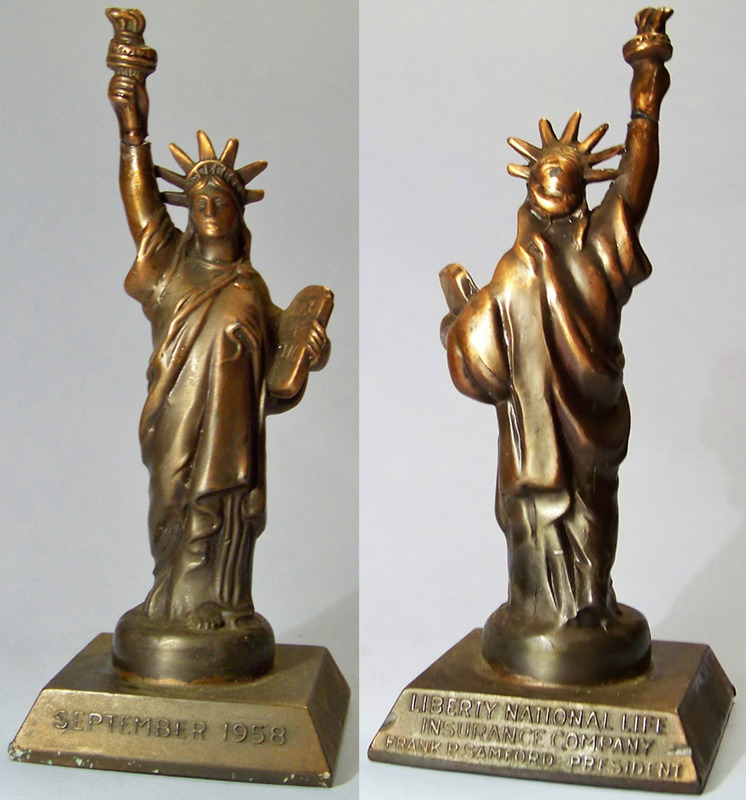 Both were produced by the A.C. Rehberger Company. 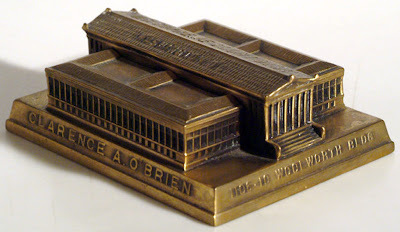 According to the capital replica's base, O’Brien had an office “opposite the U.S. Patent office in Washington, D.C.” The Supreme Court replica advertised an office address in New York’s Woolworth Building. While the originals are difficult to find, these replicas were recast in the 1990’s from Rehberger molds, but have a different finish. I’ve seen two different versions of a replica of Egypt’s Sphinx, which was also made by Rehberger, that are promotional advertisements. One advertises ‘Miller, Franklin, Basset and Company New York,’ which was an accounting and engineering firm in New York City. The company may have used the Sphinx due to the ancient engineering feat it took to build the structure and the money it took to construct. I’ve also seen references to this company with ‘Sphinx Talks,’ which may be a publication. Another version is nearly identical except for the writing on the base. “Ask the Spinks” C.C. Spink & Son St. Louis, Mo.” is clearly a play on words of the two similar names. C.C. 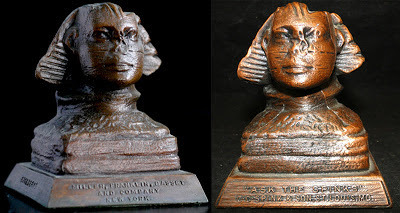 Spink & Son were magazine and book publishers including an early Sporting News. I saw a white house replica years ago advertising White House Apples.